My experience with this university was quite enjoyable. I was selected in first batch of NUML’s BBA (Hons.) program and at that time NUML was only 5 years old university. NUML is semi-autonomous institution so the overall charges of MBA and BBA programs were quite reasonable compared to Pakistan’s top business schools like NUST, LUMS etc. The faculty of our dept. was fresh and young, so we bonded a special relationship with each other. The level of education was not up to the mark, but still hard working lecturers made the learning process much easier. NUML is accredited as Asia’s one of the top language university, as it offers courses from bachelors to masters and even research level in more than 20 languages. So in our BBA (Hons.) program one foreign language was included for two semesters. This was obviously one unique aspect of our education from NUML. The overall environment of NUML is multidimensional, as you can see students from various countries who indeed add up fascinating colors to the university campus. I have stated earlier that level of the education was not up to the mark, reason being the low quality curriculum in Business Administration dept. that was not properly matched with other top universities. But now the situation is much better and NUML has worked on this aspect quite a lot to upgrade its curriculum and teaching methodologies. The facility of hostels and buses is available in NUML. On the whole NUML is progressing in all aspects from its libraries to its class rooms, from its faculty to its general administration. NUML is now one of the high ranked universities of Pakistan. Now lets have some basic information about NUML. HISTORY: Basically NUML started as an institute in 1970 to teach people different languages to help them communicate easily with each other. The concept clicked as it was the real need of new world. NUML got university charter in 1998 and now offer 23 different languages. BASIC INFORMATION: NUML is specialized in its language courses which it offers in different 23 languages. Having main campus in Islamabad its other campuses are in Lahore, Karachi, Peshawar and Faisalabad. 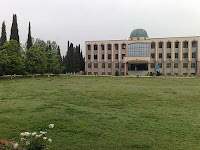 Islamabad campus is quit a large place with so many facilities available but other campuses are not quit spacious. NUML's PhD program is very hot now a days. STUDENT TALK: As this institute is reviewed by one of its own student itself so can have a better idea about what NUML students think about NUML. But as far as I have discussed NUML with its students of language courses they were quit happy and satisfied with the overall environment of NUML, particularly library that is available to its students is so much Rich in content. FACILITIES: I am not sure about other campuses but facilites at Islamabad campus are appreciable as they provide transport service all over the city. Library as I mentioned above it rich with content campus is well managed. So overall nice and attractive environment. i m kazim ali student of bba at numl. numl is best for education. the students of numl can do every thing what they want. i m Kamir Shahbaz, student of BBA hons 4 years program. now i m in final semester and select Finance specialization. Faculty of NUML is not too bad, they have knowledge and their teaching methodology is absolutely perfect, but if their is a practical work than student can easily learn. Is bus facility available on bari imam or G5 near qauid e azam uni colony? ?